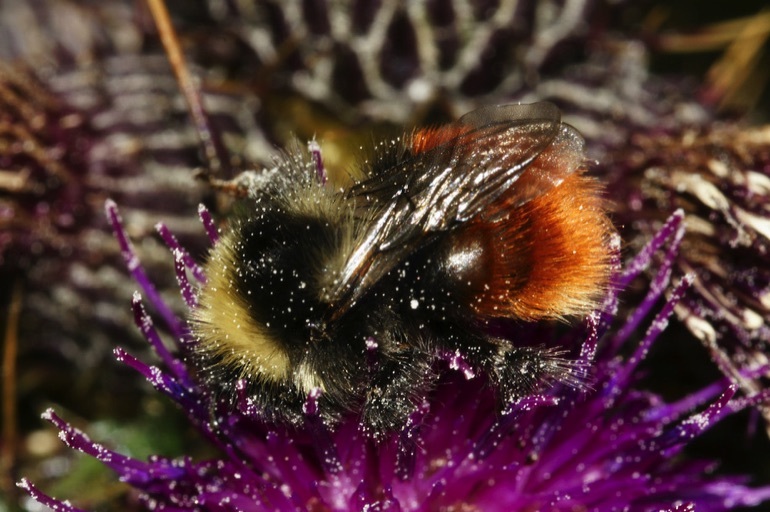 An initiative by Bumblebee Conservation Trust to transform the Peak District into a pollination hotspot is set to launch after receiving earmarked support of £850,000 from the Heritage Lottery Fund. The conservation charity's four-year Pollinating the Peak project will work with communities, local authorities and landowners to create and restore at least 300 hectares of flower-rich habitat for native wild bee species and pollinators, and also aims to involve hundreds of gardens. Citizen science will address a severe lack of bumblebee records in the Peak. Volunteers will be trained in bee identification methods, with high-quality data from surveys used to inform local and national land management action plans, and to help provide early warning of declines. A particular focus will be the monitoring of the Bilberry bumblebee, an iconic Peak District species. There will be awareness raising and education about the importance of bees and their pollination services, as well as threats to bumblebee populations and what can be done to tackle declines. Innovative methods will be used to highlight pollination in schools, and there will be engagement with local communities as well as tourists and visitors to the area, including at festivals and well dressings. As well as native wild bees, Pollinating the Peak will focus on all insect pollinators – including honeybees, hoverflies and butterflies – and the plants and habitats that rely on them for pollination. The project will formally launch next year, and will be run by Bumblebee Conservation Trust with partners including Chesterfield Borough Council, Little Green Space, and Moors for the Future Partnership. With its tapestry of habitats, vibrant communities and surrounding urban areas – and its central England location and appeal as a tourist destination for over 10 million visitors a year – the Peak offers major opportunities for a high-impact project to help pollinators, which will be rolled out nationally if successful. The area has also been chosen because of a lack of local data about bee populations. This poses the risk that populations of rarer species – such as the Bilberry bumblebee, now only found in the Peak and a few other areas in the UK – could be declining faster than has been thought. It is important to fill this data gap now in order to put appropriate management plans in place before it is too late. Protecting and enhancing local sites that have priority habitats and are of local, national and international importance – including National Nature Reserves and Sites of Special Scientific Interest – for pollinators will also benefit a wide range of other wildlife. Improvements to gardens and habitats will also improve the area for people, including by increasing opportunities to enjoy wildlife and to learn conservation skills, and by fostering pride in the Peak's natural heritage. About 70 UK crops depend on, or benefit from, visits by bees. Bees' annual economic value as pollinators of the UK's commercially grown, insect pollinated crops is estimated to be over £691 million. Yet bumblebee populations have collapsed. Of the UK's 25 species, two – Short-haired bumblebee and Cullum's bumblebee – have become nationally extinct in the last 80 years, although the former is being reintroduced. Seven species are in decline, and 11 are of conservation importance. Loss of flower-rich habitat is the biggest threat to bumblebees' survival, with 97% of the UK's wildflower meadows lost since World War II, and with large swathes of intensively farmed land now like deserts for bees. Climate change, disease and pesticides including neonicotinoids may also be major threats. Heritage Lottery Fund has awarded £150,000 up front to help develop Pollinating the Peak, with a further £700,000 earmarked for a later date. The project's consultation phase included a Pollination Conference held in Chesterfield in April 2015, which attracted experts from across Europe, and numerous local schools. 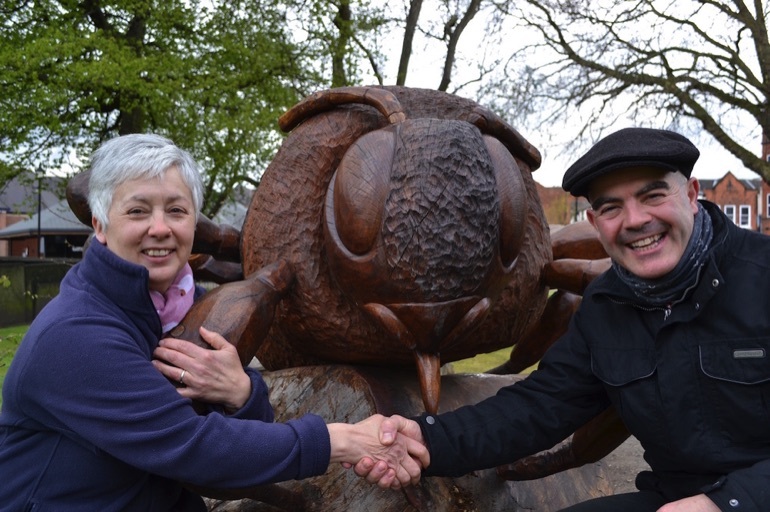 As a lasting legacy, a beautiful oak bumblebee – created by wood sculptor Andrew Frost, who uses chainsaws to transform abandoned trees into works of art – was commissioned by Chesterfield Borough Council and now resides in the churchyard of Chesterfield's St Mary's Church, the famous Crooked Spire.